The Sketchbook Challenge: Are you ready? I am excited about this project! I do not do much sketching, so this will be a wonderful way to increase my skills. Thanks! Interesting art supplies! Thank uou! This is the perfect opportunity to start taking my art more seriously. I need this. I have been thinking about a daily art challenge. who can resist a challenge AND free art supplies! Wonderful! I need to add a daily creative exercise to my routine. This would give me all the supplies I need to get started. I love to sketch-on-the-go, but I seldom have my tools with me? Ooh, a sketchy kit - that is a brilliant idea and I'm so stealing that idea for my 8yo son too! Merry Christmas, I hope you have an arty time!!! I am so happy you are doing this Sue! I have your book and I did the challenge a few years ago. I may incorporates the drawing challenge into my weekly documented art journal that I have kept for several years. I’ve been doing this on my own for a couple of years and I would like a group to share with. Looking forward to the 2029 challenge! Kit looks great - looking forward to 2019 and drawing daily! Ooooooo........you know how to get us motivated! I hope that this sketchbook challenge will get me back into creating. I'm ready and excited. One of my 2019 intentions is to spend more time with my art. You inspire me and all I have to do to smile is look at your bright Colorful Quilts or drawings. 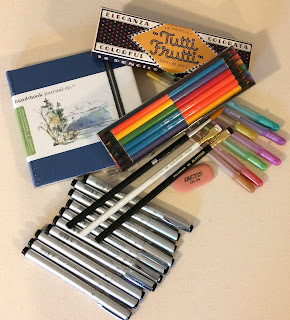 I am going to do my first sketch ever with the color pencils and sketch pad I bought my husband years ago. He is artistic I am not. 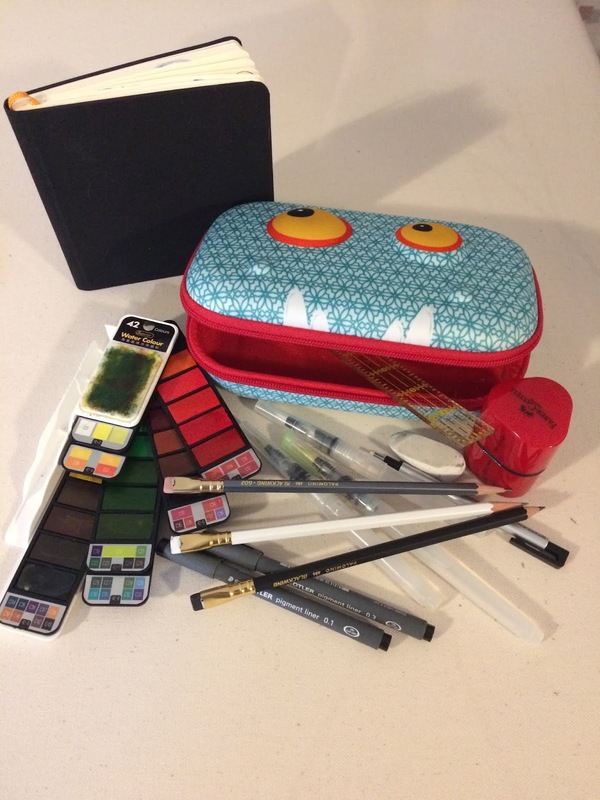 Would love to win the sketchbook kit. Look forward to the challenge. I've wanted to commit to something like this. I have your book but could never get started. Thank you for starting up again. I really want to do this challenge. It would be good for my soul right now. Can we do this by responding to your blog? I don't do FB or Insta for security reasons, but wouldn't mind you sharing the photos if you liked. "You can also post photos of your sketches on the The Sketchbook Challenge facebook page as a reply to any of the posts there if you're not on Instagram." Does that mean we can post if even we don't do FB? Jen you will have to have a facebook account in order to post on the sketchbook challenge facebook page. Jen I have set up a flickr group for those who don't want to do facebook. You'll find it here: https://www.flickr.com/groups/3198463@N20/ It's a public group but you'll need to have a flickr account to join it. Sorry but there is no way around that. I cant wait. I need to get back in touch with my creativity....Let's sketch! this will get the creative juices flowing, i do love a challenge. I was so happy to have you land in my In Box ! I am SO looking forward to this challenge 😊. Sue. I want to do this. I’m a Decorative Painter but have to do a lot of Painting & Decorating to earn my bread and butter. I need a creative outlet! Thanks for the kick-start! I’m IN! Who can resist a chance at more art supplies? I know I can't. lol I am almost ready to start sketching again. I have really enjoyed such things in the past and need this push to draw again. Thank you for the chance to win goodies and for hosting this challenge!!! What a fun thing to do! My fingers are being drawn to my pencils and sketch pad more and more frequently lately.... in need of some creativity. I am eager to start this commitment to sketch everyday. So glad you're back with this challenge, and I am hoping to be a regular participant this round! Thank you for the chance to win! Just what I need to get me going. Lovely..nothing more inspiring than a a new stash of art materials ! I've been waiting for a chance to get organized and get my work to the next level. Thank you for that perfect giveaway. what a great way to kick start the challenge! Happy holidays!!!! Sounds like an amazing way to start the New Year! I've been trying to make myself take the time to sketch and play, but have a hard time diving into a blank page. I'm really looking forward to this challenge. Thanks for inspiring us! Hi Sue!!! I'm so excited to do the Daily Drawing 2019 challenge. I have missed feeling connected on an art level with you. Here's hoping I win some new supplies! A simple challenge with the potential for loads of fun. Drawing is such a key skill for an artist. I am in a constant state of re-energizing my commitment and it usually has to do wth exciting new products like these! I am going to try. I am SO bad at daily anything. But I really want to do this. would love to win this great set! what a great challenge idea! and just to have fun! Challenge accepted! Lol can’t wait to begin. I've just recently started to sketch again. I'm excited for the new Sketchbook Challenge!!! I've done a daily fabric square for a quilt which was pretty difficult but I think this is going to be harder. Looking forward to improving my drawing skills. I just found this and am so excited! I do something arty everyday as I suffer from Chronic Pain, Summer is the worst time of year for me and I was looking for something to do to keep my mind off it. This challenge is just the thing! I cant wait to get going. I would love a chance to win. Sounds like a fun challenge. A friend forwarded your blog post to me this afternoon. I'm going to take up the challenge. I'll be sketching in my bullet journal every evening. Wish me luck!